Calendula (Calendula officinalis), or pot marigold, is very commonly used in herbal medicine as a topical anti-inflammatory and antiseptic. Its soothing effect is due to its ability to scavenge free radicals (which are products of inflammation), preventing them from causing further inflammation, and to its ability to inhibit lymphocyte proliferation (a white blood cell associated with the immune system). Flavonoids and possibly terpenoids are believed to contribute to these effects. Calendula also is credited with an antiseptic effect, but this effect appears to be very weak and does not alone warrant its current use in humans as a mouthwash and dentifrice. Calendula is, however, a potent molluscicide, meaning that it is lethal to snails, slugs and flukes. A less commonly known effect of calendula is its ability to heal and prevent gastric ulcers, due to its content of saponins. Calendula also delays gastric emptying and lowers blood sugar, effects that are of potential importance as veterinary and human medical practitioners become increasingly concerned about insulin resistance and its multiple adverse effects. Why recommend administration of calendula to my pet? Calendula is used topically for its anti-inflammatory and weak antimicrobial (antiseptic) properties. "Clinical experience with calendula suggests it can accelerate wound healing." Clinical experience with calendula suggests it can accelerate wound healing. Diluted calendula is used as an ear and eye wash. Traditionally, calendula was believed specifically indicated in non-healing wounds associated with lymphatic congestion and lymphadenopathy (lymph node swelling). Because of its effect on the stomach, calendula may also eventually become commonly used to treat gastric ulceration and inflammation. How much experience is there with the use of Calendula in pets? Calendula has been used topically for many years in pets. Dogs and cats are the pets normally treated with calendula. No controlled clinical trials have been conducted with calendula. 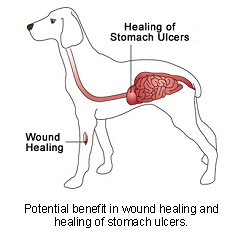 A large uncontrolled study in 1981 demonstrated its apparent ability to promote the rapid healing of gastric ulcers. Most of our knowledge regarding calendula comes from laboratory research, clinical experience, and herbal lore. Calendula is considered a non-toxic plant, but it should not be used in pregnancy since some of its constituents may cause or promote uterine contractions. "Calendula should not be used in pregnancy since some of its constituents may cause or promote uterine contractions." Small amounts of salicylic acid may also be found in calendula. While the amount is extremely small and unlikely to cause any problem at all, care should be exercised when administering calendula to salicylate-sensitive species such as cats. "Allergic reactions are common to plants of the Aster family..."
Allergic reactions are common to plants of the Aster family, of which calendula is a member. There is thus a slight risk of mild irritation when calendula is applied topically. It is estimated that perhaps only one percent of people may experience such a reaction, and perhaps even fewer animals. 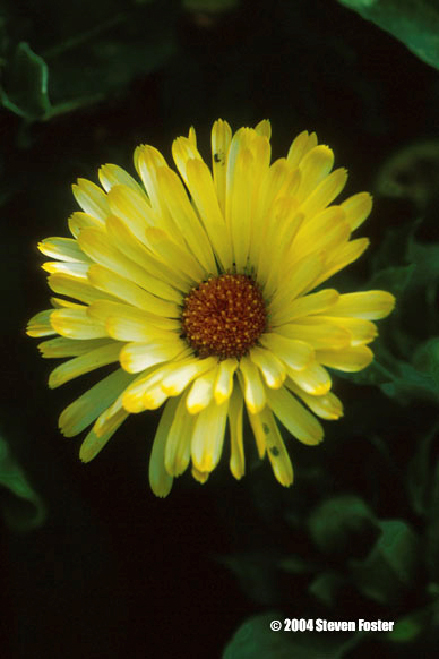 If redness or itch occurs in response to calendula, discontinue its use. Where do I obtain calendula and do I need a prescription? Calendula is often available as an extract or tincture. Pet owners are cautioned against buying supplements without knowledge of the manufacturer, as supplements are not highly regulated and some supplements may not contain the labelled amount of ingredients. Your veterinarian may have preferred brands of supplements that he or she will recommend. A prescription is not needed for calendula.